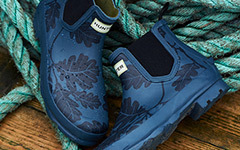 When it comes to wellington boots, the first brand that springs to mind is Hunter. Originally established in 1856, Hunter Boot Ltd holds two Royal Warrants and has grown to become the world's premier wellington boot manufacturer. From the ubiquitous, traditional style green welly which was designed by Hunter in 1956 to today's vast range of styles and designs including the classic Original Tall Boot, the more robust Balmoral range and the often quirky fashion range. 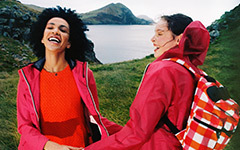 Hunter Boot Ltd now lists an enormous range of boots, clothing and accessories, remaining "...the preferred welly brand for those who like to work hard and play hard - there's a great range of boots to suit welly wearers all over the world - from the Royal Family to festival-goers, working farmers and landed gentry alike".